Houston: Anand Balasubramanian, MD, Internal Medicine Physician at Houston Northwest Primary Care, and affiliated with the CHI St. Luke’s Health The Vintage Hospital, Houston Methodist Hospital, Cypress Fairbanks Medical Center, and Baylor St. Luke’s Medical Center, has been named a 2017 Top Doctor in Houston, Texas. Top Doctor Awards is dedicated to selecting and honoring those healthcare practitioners who have demonstrated clinical excellence while delivering the highest standards of patient care. 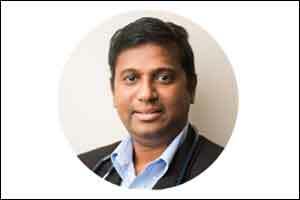 Dr. Anand Balasubramanian is a highly experienced internist who has been in practice for more than 25 years. His acclaimed career in medicine began in 1992 when he graduated with his Medical Degree from the Thanjavur Medical College in Tamil Nadu, India. After moving to the United States, he completed a residency at Coney Island Hospital in New York, before entering private practice. Dr. Balasubramanian is certified by the American Board of Internal Medicine, and provides expert diagnosis and treatment for a wide range of conditions. Among the conditions treated by him are allergies, dermatitis, asthma and bronchitis, anxiety, obesity, high blood pressure, osteoarthritis, and anemia. He also provides a comprehensive range of medical examinations and check ups, and administers vaccination and immunology shots. Dr. Balasubramanian is renowned for his caring and compassionate attitude as well as for his expertise as an internist, and he is always happy to discuss conditions and their possible treatments with his patients. This laudable philosophy makes Dr. Anand Balasubramanian a very worthy winner of a 2017 Top Doctor Award.